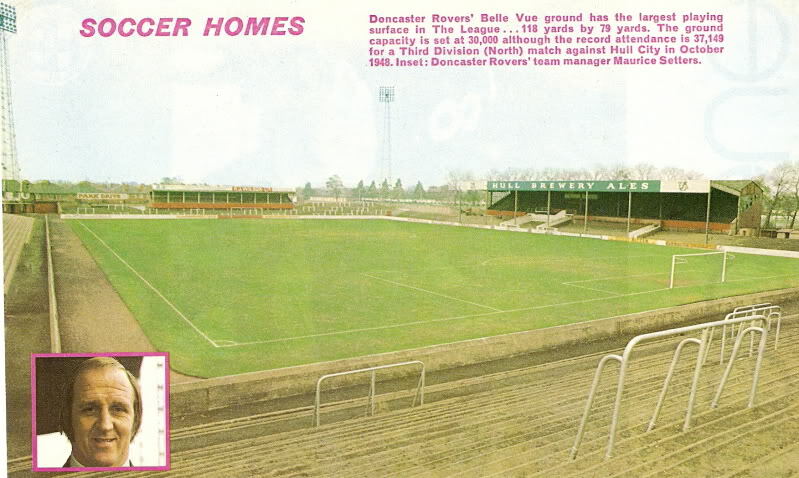 Doncaster Rovers played at Belle Vue from 1922 till 2007, the ground was named after the views over the pastures and the local council originally banned the football club from spoiling the view by building stands !! In its final few years the ground was renamed the Earth Stadium, a move that wasnt universally popular with the football clubs fans. The picture below from a 1970's Football review magazine shows the ground as it was. "Doncaster Rovers Belle Vue ground has the largest playing surface in the League ... 118 yards by 79 yards. The ground capacity is set at 30,000 although the record attendance is 37,149 for a Third Division (North) match against Hull City in October 1948. Inset: : Doncaster Rovers team manager Maurice Setters."